The Japanese card of the day is a single rare stride for Dark Irregulars from G-BT03: Sovereign Star Dragon, the Storm of Love Kiskil-Lilla. Named for the Sumerian incarnation of the night-storm demon Lilith, Kiskil-Lilla is an early game on-hit stride on the same level as Gablade and Grim Recruiter in other clans. Like those units, Kiskil-Lilla's primary role is to act as a high power pressure unit that baits opponents into dropping more guard to block her than her cardfighter would gain from her on-hit, but in the event that her attack does hit the setup it grants will greatly expedite the process of setting up killing moves like bringing out the Abhorrent One. AUTO (Vanguard circle): When this unit's attack hits a vanguard, Soul Charge 2, and if the number of cards in your soul is six or more, draw a card. Counting the cards granted from her on-hit, to reach the six soul skill for Kiskil-Lilla's draw skill you'll generally need to soulcharge 2 beforehand. 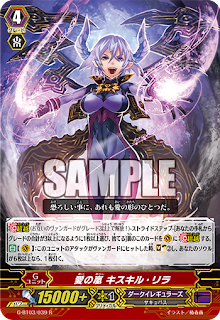 The easiest way to do this is with the House of Amon series, as in addition to the Hell's Draw, Deal and Nail soulcharge support they already have, in G-BT03 they've also received a new first vanguard "Amon's Follower, Barmaid Grace." When striding with Kiskil-Lilla you'll also receive the name of the unit in the heart, and by striding over either Astaroth or Amon himself you'll be able to use their skills to reach Grace's conditions. Using the Amon series also grants access to the trigger unit Amon's Follower Grausam, who when soulcharged can pay a cost of counterblast 1 to retire an opponent's unit. G-BT03 introducing on-soulcharge skills scales up the threat of Kiskil-Lilla immensely, as without any particular dedication on your part the opponent is now threatened by these skills giving you forms of advantage in addition to Kiskil-Lilla's draw. This incentivizes them to put down their hand guarding a high power center lane they should be ignoring, weakening their defenses for later on in the fight. Alternatively, when using the on-stride counterblast of Charharlot Vampir the soul will already be at 4 from Charharlot's soulcharge 2 and so naturally reach 6 if Kiskil-Lilla hits. The skill that Charharlot gives to Kiskil-Lilla when she strides will also trigger with a timing just prior to her draw effect ("when this unit attacks a vanguard"), so that if you reach the 6 soul threshold prior to attacking you can both draw a card and retire an opponent's rearguard that turn while getting the soul prepped for the Abhorrent One. Werbat Ordonnanz, Dimension Creeper and the Alluring/Flirtatious Succubi can all enable this. 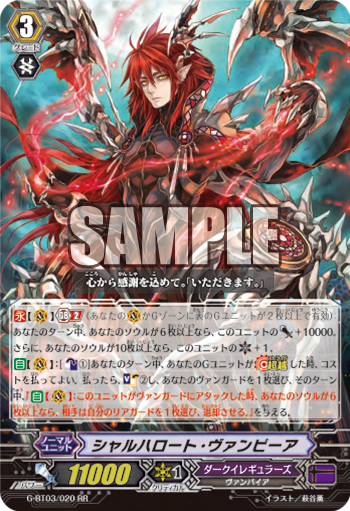 In other words, both Amon and genericized Dark Irregulars give you access to similar soul engines as well as draw and retire skills, but they come attached to different timings are each convenient in different ways. Using Charharlot generally means losing access to the benefits of legion as well as quick on-call soulcharge skills, while using Amon takes away the guaranteed nature of your retire skills and makes you dependent on rearguards for soulcharging. The choice of which to use is up to you. One should be careful not to make the mistake of trying to combo Kiskil-Lilla's soulcharge to Doreen the Thruster; because Doreen only benefits from main phase soul charges, and Kiskil-Lilla's on-hit takes place in the battle phase, it's impossible for Doreen to power up from the Storm of Love. Similar mistakes were common with No Life King Death Anchor several years ago, with many newer Irregulars cardfighters mistakenly believing they could put +15000 power on Doreen from Anchor's on-attack skill because it put five cards into the soul, and it would be easy to make the same mistake with Kiskil-Lilla's soulcharge 2.